I got this idea from a newsletter from one of my media providers and took it up. For me this is especially true and sometimes I a need a kick or in this case a match up my proverbial. This project is a perfect example. This year when the thought came (again) I just went for it, without any excuses. No more – “Wait to tomorrow or for some situation to get better”. That will never happen if you don’t take that step. Instead of saying, “when I have more money, or when I have more time, or when I get this or when that person does that, than I will do it” No. Light a match under your bonnet and get cracking. The only given is now. Tomorrow or the next moment is not a given. Do it. Grab the moment and go for it. Be present and live in the NOW. Remember there is no failure, only those definitions that others or your mind place on you. Drop them and go for it. I almost forgot. Thanks to my kids, Jade and Joel for helping me press the shutter cable on this one. Hard to hold a matchbox, light a match and press shutter release cable. Fabulous shot and a perfect message! As I get older the importance of just going for it becomes more important. Great post. Thank you for sharing! This is absolutely true! Now is the time! Great post and photo. I’m with Angeline and I also see the great importance in mastering a few things rather than a lot of things the older I get. Was wondering how you managed all the things that needed to be done to get that shot right! Great capture. I could give you the settings but it wouldn’t work for you as the light in my kitchen is probably very different to yours, plus I had a backlight coming through a window behind the box. At the time I was too lazy to go black out the window. You best bet would be the following. Set up in room with sufficient light. Set up camera on a tri pod. 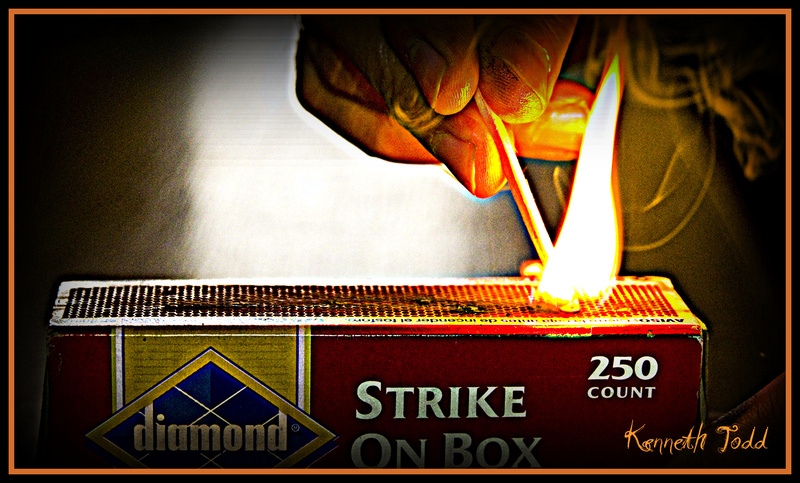 Use your manual settings on camera and then just light a match. Expose for the lit match as that is key. When you know the exposure for match you will have exposure for your photo. Overexposed and it wont work, so expose for shadows or at least, underexposed would be better. You will probably use a fast shutter to capture movement of hand too. Which means you will probably find the box underexposed and won’t be able to see the writing. If you really wanted to see the writing on the box, you could get as basic as putting a torch on the table and shining on writing. Just keep trying. With digital you have nothing to worry about, you just keep dialling the exposure until you get it and delete the ones you don’t want. REMEMBER – never delete what you see in LCD. Delete when you see it on computer screen. What doesn’t look good in LCD, sometimes looks great on computer. Let me know if you need more guidance.